Since 1840 Domaine de Bel Air has perched at the top of Bel-Air Hill, overlooking the Ardieres Valley. From here you can also see Beaujeu, the historic capital of the Beaujolais region. The vineyards are on the fully south facing slopes of Bel Air. 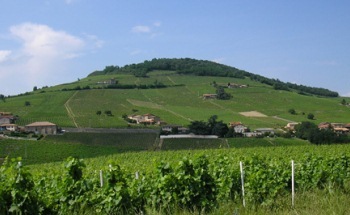 The terroir is made up of blue granite which produces superbly fruity and generous Gamay wines. Owing to the steep vineyard slopes, almost all vineyard work is done by hand. Winemaker Jean-Marc Lafont and his wife Annick have been running the estate since 1986. In 1992, their deep love for the land made them decide to use eco-friendly integrated vine tending techniques. This involves understanding the biology of the vines as well as the beneficial fauna living in the vineyards. By observing and inspecting vines regularly, many diseases can be prevented in their early stages. By keeping with tradition and staying in tune with the terroir of the region, Domaine de Bel Air produce highly expressive wines. Each terroir’s grapes are converted into wine in low-capacity vats. This process produces wines that are true to type. One concession made to modern wine-making is the use of temperature control. This is used to retain the distinct aromas and flavours of the wine. Following alcoholic fermentation, the wines are racked into large oak vats. Here the wines mature slowly. Didn’t Have Time to Exercise? Drink Red Wine!